Loosely based on legends about a famous saint, this book tells the story of Nicholas, who discovered the fun of doing secret good deeds. Kids who read or hear the story at any time of the year will be challenged to do the same. You can read my review by clicking here. The legend of St. Nicholas comes alive in this touching story by Janet Ann Collins. 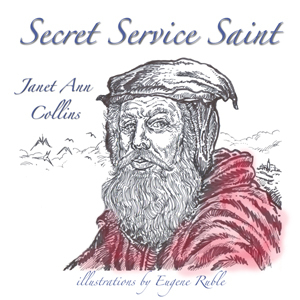 Loosely based upon the legend we all know of the gift-giving Greek Bishop, Nikolaos of Myra, in Secret Service Saint, Nicholas is seen as being keen on adventure. When he is shipwrecked and forced to swim ashore, he finds the people happy to see him. They had been praying God would send someone to lead their church. They make him a special red robe and hat, so everyone will know how important he is. After a time, Nicholas feels his life no longer is filled with adventure. 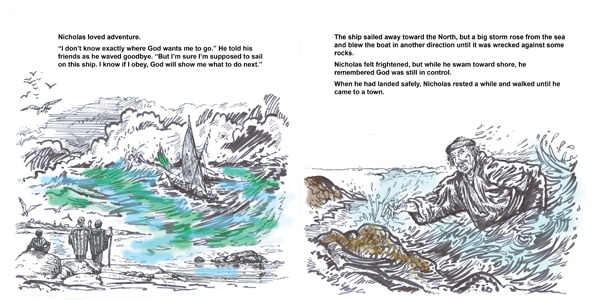 When God gives him a secret charge, Nicholas finds a way to help the people and satisfy his need for adventure too. I have to admit, I’ve never read much about the saint who Santa Claus is based upon. It’s odd considering I was brought up Catholic, where saints are revered, but Secret Service Saint made me want to perform some additional research into what I could find. For kids, this is a charming story of how a man is changed by God’s will for his life. Told using words and actions young people can understand, they will easily be able to grasp the message of servanthood and true discipleship behind the story. Talented artist, Eugene Ruble, provided the illustrations for this book. It was his work on Secret Service Saint that led me to feel he would be perfect to bring my book, Little Shepherd, to life. The illustrations for this book are mostly black and white, but some of the people and other special items are colored in with pencil to give an old world feel to the story. It works beautifully. I’m glad I purchased a copy of this book from Guardian Angel Publishing earlier this year. You’ll love the message this book teaches and your kids will enjoy talking about Saint Nicholas in a new way.